I like vegetarian dishes a lot and so I thought I would give it a try. The amount of ricotta the recipe calls for seemed like a lot, so I scaled it back. It's really a delicious "lasagna" and it was great the next day, too. Thanks, Mom! Slice zucchini into long slices. Cook in boiling water just until limp, about 5 minutes. Drain on paper towels. Combine ricotta, eggs, parsley, seasoning and half of the parmesan cheese and half of the bread crumbs in a bowl. Set aside. In a 9x13 pan, spoon a thin layer of tomato sauce. Sprinkle with a quarter of the bread crumbs. Arrange layer of zucchini over this. Spoon half of the reserved ricotta mixture on top of the zucchini. Sprinkle with half the mozzarella cheese. Arrange the rest of the zucchini over this, layer more tomato sauce and the rest of the bread crumbs and top with remaining ricotta mixture. Top with remaining mozzarella and parmesan. Bake in a 350 degree oven for about 1 hour or until top is brown. Let stand 20 minutes before cutting. * When using bread crumbs, try making your own. Take any kind of bread you like, even leftover stale bread that you may want to throw away, and place in your food processor and grind until fine. Keep in a plastic container in the fridge and they will last a long time. Fresh bread crumbs are superior to what you can buy in the grocery store. The lasagna looks great but the picture of your mom is priceless. This is a lovely story - and the recipe looks great. I'm going to wait until summer when the garden is bursting with zucchini to try it. My mother was English, and I have a number of her recipes, but there's one I don't have. She made a wonderful "Yorkshire" pudding, which was very different from the traditional popover-type. The texture was more like cornbread, and it was delicious with gravy. I have never found a copy of the recipe. Maybe I'll be lucky too and find it scribbled in the back of a book someday. What a wonderful photo of your Mom.. finding her recipe is like finding an old friend. Her lasagne looks delicous! I got choked up. Thanks for sharing your mom with us. The recipe sounds good, and just knowing that it has a history makes it even more appealing. I have a notebook of my grandmothers that has some handwritten receipts, as she called them, along with some recipes she cut out of magazines and newspapers. It's a treasure to me. Oh, you made me cry. My mother was a wonderful cook also. I love finding recipes written in her handwriting. I miss my mother so. I too have a file with recipes from my grandmother and my mother. My daughter is a vegetarian and I will make this for her. I am sure she will love it. It looks delicious. February 11, 2009 | Debbie M.
This looks fabulous. I can't wait to try it as a passover dish (with matzo meal of course). I love making lasagna with zucchini like this, and loved seeing the recipe from your mom! This looks AMAZING - I am making it this weekend! What a cool picture of your mom. I love old family recipes. I can't wait to try this one. The photo of your Mum is gorgeous. I've kept a lot of my mother's handwritten recipes too. What a treasure to have that cookbook with her recipe in her own hand! I love old cookbooks, and always look for them at estate sales. It breaks my heart that someone would get rid of them! I was at an estate sale once, and there must have been 4 cookbooks, all of recipes cut out from magazines taped gently in the cookbooks, with hand written notes such as "add more pepper." I went to the daughter thinking she must not want to sell these, and she said "you can have them all for .50 cents! I gladly accepted! I am going to add you to my blog roll so I can find you again! My husband is first generation American - his father was born in Florence Italy and didn't come here until the age of 13. This is a lovely story for a great recipe. It looks so rich - love it when the cheese is browned on the top like that. Looks awesome! I'm on a veggie kick right now so I think I will have to try this recipe. Thanks for sharing. I can't find the right word to describe your pictures. They make my mouth water. I'm soooooo making this! I have a bunch of zucchini in my frig! Thanks Angela, and Elaine! So poignant to come across recipes in one's mother's hand - I always get a jolt when I do. But, then I can almost hear her instructing me as I read it. Nice. I love seeing the recipe in your mom's handwriting. What a fabulous find. 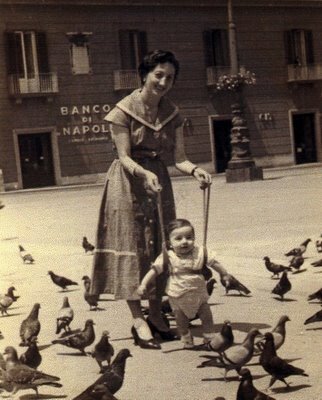 And that picture is one of my favorites of your mom and that cute little boy. Of course, I am a little partial! You continue to inspire me in the kitchen Elaine! Did I forget to tell you I made this??? I'm losing my mind! my hubby and I had this for dinner soon after I first saw it. We both loved it. I'm making it again this week! What a great story Trying this for the first time. Love simple and tasty recieps. This is a great reciep. I was the hit at church with this delicious dish. Made it tonight! I must say WOW! Even my husband who is always a new recipe skeptic made me write it down and had seconds! Thanks for sharing! We LOVED IT! My husband invited the neighbors over and even the neighbors husband who doesn't like zucchini had seconds! What a beautiful website! THANKS for sharing! Needing inspiration for our bountiful zucchini crop, I thought to search 'zucchini lasagna' and netted this great recipe. We just finished dinner and I'm already sending the link to my SIL! YUM! I added fresh snipped basil. This will be a new favorite. Thanks for posting. This is what I am going to do with the two huge zucchini I have waiting for me in the back yard. My neighbor and I have a bountiful zucchini crop and I am excited to find a meat free lasagna to boot. I love the photo of your mom and can't wait to try this. Will do this tomorrow!! Hugs! I just joined your site. Such inspirational photos and look forward to browsing through! I got the whole zucchini lasagna ready..made home made marinara, home made bread crumbs and the basil, tomatoes, zucchini, garlic, parsley, oregano all from the yard....it smells wonderful. PROBLEM: my stove just broke!!! I will have to run this over to a neighbors house! I guess that will get others to go to your site after smelling it! I can't wait to try it! I googled in search of a recipe for zucchini lasagna the other day; this was first recipe that came up and it looked good. I made if last night for my sister who was visiting who is a vegetarian; IT WAS TOTALLY AWESOME, CAN NOT WAIT TO MAKE IT AGAIN. THANKS FOR SHARING. I loved this! My daughter and her boyfriend stopped by just as we were finishing up dinner so I offered them some. When I told my daughter it was zucchini lasagna she wasn't to excited but tried it anyway. When the two of them were done I no longer had leftovers. Guess I'll have to make another batch! Thanks for the great recipe. I used it on a huge (3.5lb) zucchini I had no idea what to do with. IT WAS GREAT. "Arrange layer of zucchini over this (should there be red sauce here?) Spoon half of the reserved ricotta mixture on top of the zucchini." Using up the zucchini surplus: Yes, there is red sauce. First step is to put a thin layer of tomato sauce on the bottom of the pan and then some of the bread crumbs and then lay the first zucchini layer on top of that. Then put half of the ricotta mixture on top of the zucchini and continue. I am going to use one of my giant Alaskan zucchinis and try this recipe tonight! Love the pic of your mom and brother. Beautiful! What a find! My daughter who is 8 1/2 months pregnant, is wanting me to make some recipes to freeze for after the baby is born. Since my garden is giving me an abundance of zucchini, the timing was perfect - Googled zucchini recipes, and yours was the first to come up. Thank you and your beautiful Mother! I loved this recipe, I think zucchini "noodles" are better than the regular ones. Thanks! Oooh, yum! I'm eating this now for lunch after having it for last night's dinner. So good! Thank you for sharing it! Wish every search could be answered as quickly as this one was. Haven't made it yet, but will this weekend. Thanks! I made this for dinner last night and it was delicious! I also added some fresh basil from my garden. I had it for lunch as well and it was great. What a great way to use up zucchini. I love your website...it is now one of my favourites!! Thank you!! I've changed my diet to take out most breads and pastas and I've craving lasagna. I googled Zucchini lasagna and you came up. This looks fantastic, thank you so much for putting it up, and thank you for sharing a piece of your family. Handwritten from Mom, can't beat that. I made this last night and LOVED it. Beautiful recipe. Thanks so much for your recipe, I made it for my husband and his good ol friend who is a meat and potato guy and they savored the dish and asked about the ingredients and said it was soooo good. Thank you! This is one of my favorites! I have lots of zucchini my friend gave me from her garden and I think this recipe will be perfect for it! I'm trying your recipe today, June 22, 2010, and would like to copy/paste some of the photos on my blog with the recipe and link to your site. Is that ok? Can I copy the picture of your mom? Can I copy images of your lasagna? I was looking for a zucchini lasagna recipe and I found your blog. Just wanted to let you know we LOVED it and I will be making it again. Thanks! Mmmm, that looks lovely, and I was thinking about making zuccini lasagne for dinner tonight too! Perfect! I was looking for something different to do with all of the zuchinni. Absolutely wonderful! Awesome! Just tried this recipe because I have mammoth zuchinis on my hands. I made 3, one your way and 2 just whatever was around. Your recipe came out great, I love it! For the others I added a layer of mushrooms, artichoke hearts, shredded carrots and sliced olives in there. I had lots of leftovers to use up and I love having lasagnas around. Thank you! !